Many of the collections in Heritage Quay demonstrate the ways that women sought opportunities to acquire education and build more independent and prosperous lives for themselves. 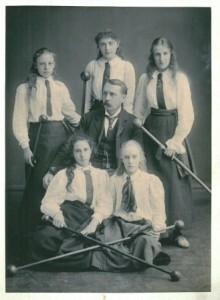 From the early part of the 19th century the records of the Huddersfield Female Educational Institute and subsequent incarnations of the Technical Colleges demonstrate how education for women transformed from the traditional ‘female’ skills of cookery and needlework, to more academic and industrial courses and how opportunities to pursue technical and higher education increasingly began to open up to them. Photograph from the School & University records of the Scholes Monaghan Archive, pre 1917. 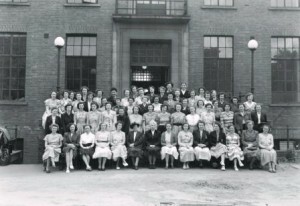 Midwifery students, Ruby Ward Archive, c1940s. 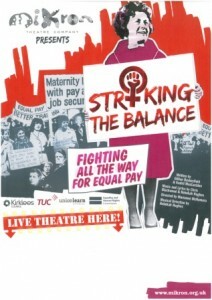 The experience of women in employment can be examined through the oral histories of nurses gathered in the Graham Thurgood archive, and documents relating to women’s employment in nursing and midwifery (Huddersfield Royal Infirmary archive; Ruby Ward archive). Women as advocates, both politically and for social causes, e.g. 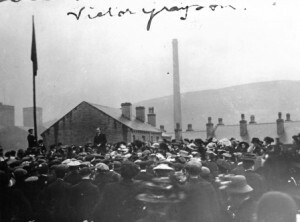 pensioners rights, can be traced through the records of women’s groups in political parties (Colne Valley, Denby Dale and Huddersfield Labour Parties) or in individual collections (Noreen Logan archive). 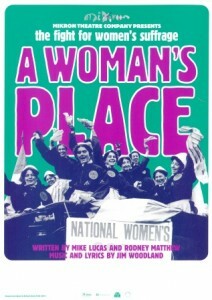 While the extensive arts and music collections at Heritage Quay (British Music Collection, Mikron Theatre Company, Huddersfield Amateur Operatic Society…) contain an immeasurable number of stories that reveal the lives, careers and influence of women on the national and international cultural landscape. 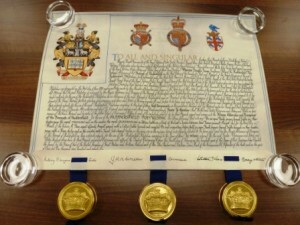 The Rugby Football League (RFL) was founded in Huddersfield in 1895, so it is fitting that the archives of the RFL, the Huddersfield Past Players Association, the Up and Under oral history project and the papers of MEP Terry Wynn, can be accessed in Heritage Quay. 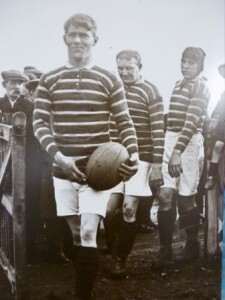 Harold Wagstaff leads out Huddersfield Rugby League team, 1909. Know the game rugby league football, c1950. 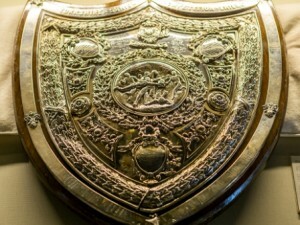 The rugby league collections present an unmatched history of the sport through unique documents such as minute books, player registers and correspondence. There is also the opportunity to get close to rare match programmes, photographs, tickets and one-of-a-kind shirts, caps and balls. 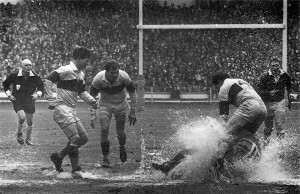 Photograph of 1968 Challenge Cup Final between Leeds & Wakefield Trinity which became known as the ‘Watersplash Final’. A photograph of women’s Rugby League, c1990s-2000s, which we are keen to identify. Can you help? The archives offer a fascinating insight into social history from the late 19th century to the present day. At Heritage Quay you can explore the history and identity of the working classes; understand the importance of gender and regional identity in the sport; and discover the international reach of a sport born in Huddersfield. Smaller collections on cricket are also held, including a full set of Wisden. Huddersfield’s fascinating political history is brought to life in Heritage Quay by the extensive range of collections that document the area’s 20th and 21st century political story. The overarching influence of the labour movement and the Labour Party on this narrative is keenly reflected through the collections. 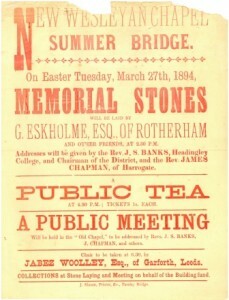 From the emergence and development of the Party’s grass roots (Huddersfield Labour Party Archive, Colne Valley Labour Party Archive and the Denby Dale Labour Party Archive) to the upper echelons of Westminster (J H Whitley, MP and Speaker of the House of Commons and JPW Mallalieu, MP Archives; Robert Blatchford Collections) and New Labour politics (Mick Clapham, MP Archive). 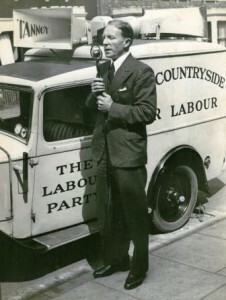 William Glenvil Hall, Colne Valley MP, 1939-1962. 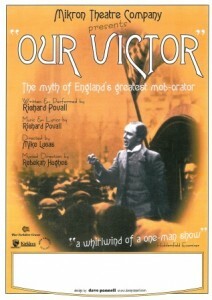 These collections reveal the local realities of the national party political system, and how this system has been informed and influenced by the unique character of Huddersfield’s political landscape. The library of famous statistician G.H. Wood covers economic and social history, education, health, housing and women’s history during the late 19th and early 20th century, and complement more contemporary left-wing publications including the Left Book Club and modern periodicals. 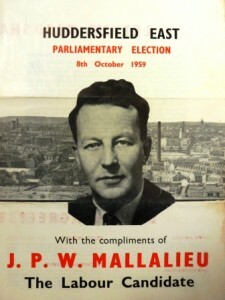 JPW Mallalieu, General Election leaflet, 1959. 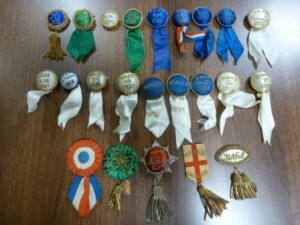 The largest collection charting the history of non-conformity is that of the Wesley Historical Society (Yorkshire Branch). This collection which is still actively accruing material, covers circuit plans, leaflets, books and supporting historical material (such as centenary and anniversary brochures for chapels) for Wesleyan Methodist chapels across Yorkshire. It is an equally interesting collection for genealogists as it is for researchers of Methodist history. The history of chapels can be traced, as can the careers of preachers and the involvement of local individuals and families in the history of a particular place. A supplementary reference library also exists to complement the archival collection, which contains original books from the nineteenth century and books providing historical context and analysis of Methodist history, magazines and conference proceedings. The Lumbutts Sunday School Archive is an example of a library collection removed intact from a chapel and transferred to the archives which speaks to the methods used at the time to teach young children, and the type of literature deemed most appropriate at that time. 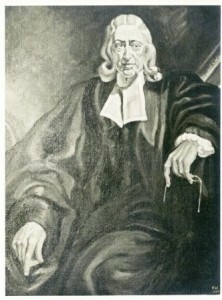 Print of a painting of John Wesley by Frank Salisbury, c1932. 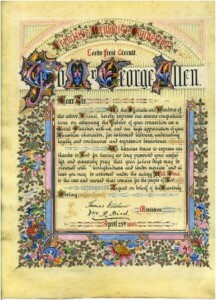 Illuminated certificate presented to Mr George Allen, Leeds First Primitive Methodist Circuit, 1887. The Scholes-Monaghan Collection is an archive of the history of a family involved in Wesleyan Methodist missionary work throughout the later nineteenth and twentieth centuries. These contain personal accounts of journeys to and missionary work in China, and ephemera collected during their time abroad. The collection also reflects the history of a family, with photographs and accounts of journeys through Europe, diaries, educational and family documents and correspondence. The Guest collection is another family archive deeply rooted in the Methodist tradition. 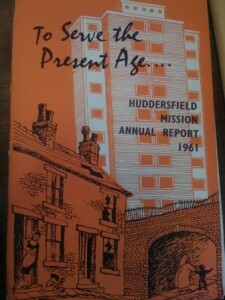 Huddersfield Mission Annual Report, 1961. There are also a number of smaller collections reflecting the history of non-conformity across the past two centuries. The Randerson collection contains Wesleyan Class Tickets from the 18th and 19th centuries. The Pacey Sermons contain transcripts of early twentieth century sermons, whilst a collection of books in the John Lancaster collection chart the history of Christadelphianism and the Leonard Smith collection contains books on Unitarianism. 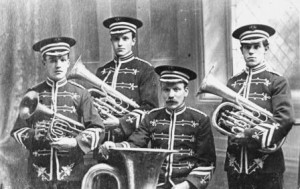 Music forms one of the most important strengths of the Heritage Quay collections owing to the rich and diverse musical life of the Huddersfield area. 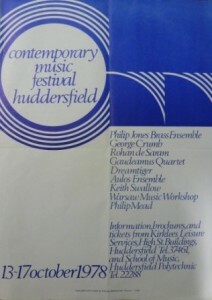 From the cutting edge performances of hcmf//, the UK’s largest international festival of new and experimental music, to the history and tradition of the region’s musical societies (Incorporated Society of Musicians, Huddersfield Branch) and ensembles (Slaithwaite Brass Band, Goldberg Ensemble) as well as the comprehensive specialist collections (Early Music, British dance bands). 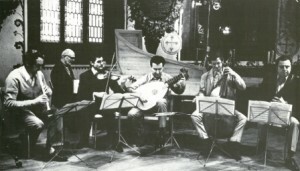 Linde Consort (Early Music consort), Basel. 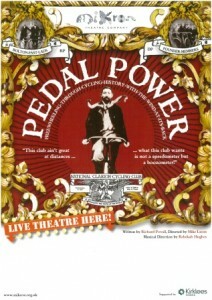 It is this vivid musical tradition that brought the prestigious British Music Collection to the University in 2010. Containing over 60,000 scores and recordings of 20th and 21st century British music, this archive represents a treasure trove of musical creativity and innovation. Whether exploring the works of high-profile composers such as Britten, Tippett, Birtwistle, Weir, Maxwell Davies, and Turnage, or investigating the unpublished or currently emerging composers on the contemporary music scene, a wealth of inspiration awaits. 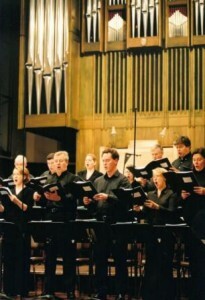 BBC Singers performing at Huddersfield Town Hall, HCMF 2003. Sir Lennox Berkley at the British Music Information Centre, 1980s. 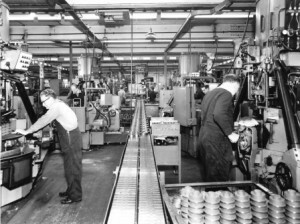 We have two major industrial collections in the archives at Huddersfield. Both were local businesses and large employers, but they go further than just relating the story of successful businesses. Their position as large employers means they can also tell a social story, of how employees interact with their employers, and how businesses can help chart the story of their employees’ lives. 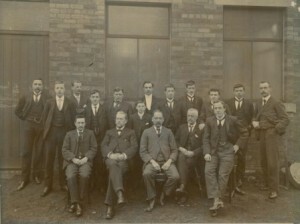 Hopkinsons Ltd. was a business with its roots in Huddersfield from 1824, and it remained at the heart of the town until the 1990s when it was bought out by the Weir Group. In addition to information on its products, which included building valves for the military and power stations, it has a range of marketing, exhibition and staff records for over a century. From exquisitely designed plans of their stand area in the Empire exhibition of the 1920s, to the staff magazine of the mid-twentieth century. 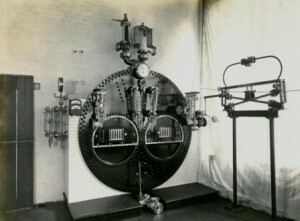 Hopkinsons Exhibition Boiler Front, 18 August 1931. 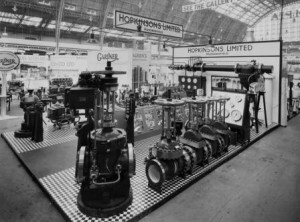 Hopkinsons stand at the Shipping, Engineering & Machinery Exhibition, Olympia 1935. 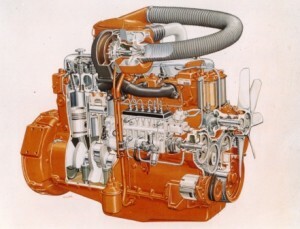 This theme is further revealed through the archive of the turbocharger manufacturers Holset Engineering Company Ltd. whose archive continues into the modern day. These collections provide detailed evidence of the engineering processes and business achievements of these companies, but just as importantly, they illustrate the fundamental impact that the development of industry has had on the social, cultural and political history of society through the lives of the individuals they employed and the communities in which they were based. A few collections have a more tacit relationship with industry. Our Textile Fabrics of India collection has its roots in acting as a promotional tool for Northern industrial mills to copy the patterns and styles popular in 1860s India in order to be able to sell their goods into that market. There are major links between aspects of industry and the university institutional collection. From the early days of educating their workers on day release or in the evening, to working with the university to accredit students and influence the syllabus, many types of industries and industry bodies feature in both correspondence and principal’s papers. The library of George Wood also contains a wealth of material on industrial relations and working conditions in the nineteenth century, as well as information on legislative and employers concerns. 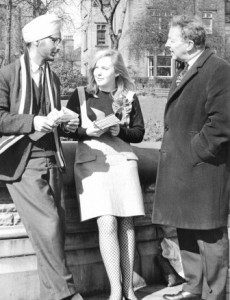 Education has been central to the development of Huddersfield for nearly two hundred years. 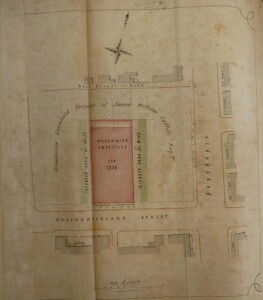 The archive of the University of Huddersfield reflects both an historical interest in giving the working classes a good education, and the philanthropy of local businessmen and land owners, who supported the reading rooms of the mid-19th century. These were the catalyst for the Huddersfield Mechanics’ Institute and the Huddersfield Female Educational Institute, both of which initially taught basic skills to local people on a subscription basis. 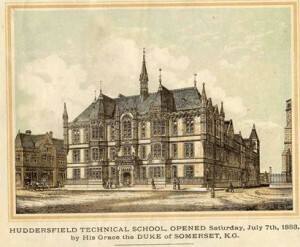 Educational trends then moved toward vocational education, and the institution evolved into the Huddersfield Technical College, which offered day classes to younger students and evening classes to those employed on a full-time basis. 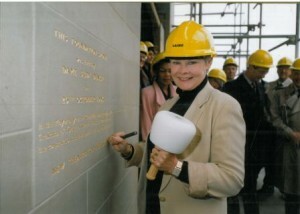 Other educational collections include Holly Bank (Technical) Teacher Training College, which focused on producing a new generation of skilled vocational teachers. 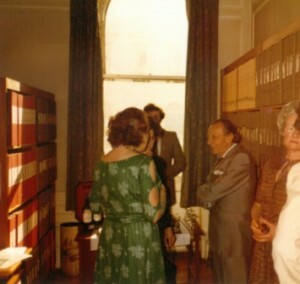 The records of the West Yorkshire College of Health, the National Adult School Union and the Open College Network are also held in the archive. The collections also reflect some areas of research and inter-disciplinary studies (Canter Environmental Psychology; Cullingford and Booth printed collections; Buck Architectural archive).